Note: This page lists all guest friendly hotels in Pattaya, including some hotels that aren’t rated very highly by guests. If you just want to see guest friendly Pattaya hotels with high user review scores, view our Top-Rated Pattaya Guest Friendly Hotels page, which only includes hotels with user ratings of 8+ out of 10. Looking for a guest friendly hotel in Pattaya? Pattaya is one of the world’s top adult entertainment destinations, so it should come as no surprise that there are hundreds of hotels available for you and your partner to enjoy a comfortable night’s stay. Many hotels in Pattaya let you bring a guest back to your room. However, many hotels have started to charge extra fees or place restrictions on the guests you can bring back to your room. This is a major annoyance and it means picking the right hotel for your time in Pattaya is very important if you plan on spending time with local girls. Luckily, there are still lots of hotels in Pattaya that are 100% girl friendly and will let you bring back a partner to your room without any extra fees or unwanted attention. Below, we’ve built the most comprehensive guide on the Internet to guest friendly hotels in Pattaya. Our list includes every guest friendly hotel in the Pattaya area, ranging from popular hotels close to Soi 6 and Walking Street to quieter accommodation options near Jomtien Beach. The vast majority of the hotels on our list do not charge a joiner fee, meaning you can bring back guests without having to worry about any extra fees. If a hotel charges fees for guests, we will have noted it in the hotel description. We contact all hotels listed below often and update our list frequently to make sure everything is 100% up to date. Our site owner also visits all of these hotels on a yearly basis to make sure they’re suitable for bringing guests back to. All of the hotels listed below were verified guest friendly with no joiner fees in February 2019. To read our full list of all guest friendly hotels in Pattaya, just scroll down. Note that this list does not include any hotels in Jomtien. To see those, you’ll need to read our list of guest friendly hotels on Jomtien Beach. Enjoy your time in Pattaya! Visiting Pattaya on a low budget? These hotels are the cheapest guest friendly hotels available in Pattaya with good review scores (7 out of 10) from previous guests. While these hotels are nothing special, they’re acceptable if you have a very low budget and don’t mind dealing with small rooms, simple furniture and a little extra noise. This is, in my opinion, the cheapest acceptable quality guest friendly hotel in Pattaya. It is extremely basic, but costs almost nothing (last time I checked, the rooms were about 500 baht per night) and has clean rooms and a great location close to Walking Street. If you don’t mind small rooms, this hotel can be a great budget option. There are two choices of rooms — budget rooms, which are very small at just 13 square meters, and larger front side rooms which offer 20 square meters of space. All of the rooms are clean and have surprisingly comfortable beds. As you’d expect for a hotel around Walking Street, Walking Street Guest House is 100% guest friendly. You can bring guests back from the nearby bars without any problems, and the staff are friendly and welcoming. There’s free Wi-Fi throughout the hotel and in all rooms, making this the best ultra-budget option in Pattaya if you want to be close to the nightlife. Rated 8.1 out of 10 by Agoda users. Dream Hotel Pattaya is a simple two star hotel located less than two minutes from Walking Street. 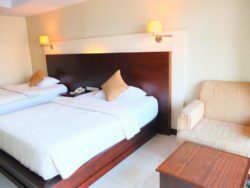 The hotel itself is fairly basic and there are no facilities like a pool or gym, but the rooms are clean, comfortable and some of the best you’ll find in town for the price. If you’re looking for a simple place to stay and don’t need a swimming pool, bar or other in-house facilities, Dream Hotel is worth the money. It’s also conveniently located close to some of Pattaya’s best go-go bars and beer bars and has a 100% guest friendly policy, meaning you can bring a new friend back without any problems. All in all, this is one of the best ultra-budget guest friendly accommodation options close to Walking Street. Rated 7.1 out of 10 by Agoda users. Located right in the heart of Walking Street, P.72 Hotel is a good option if you want to be close to the go-go bars and beer bars around the area. Rooms here are spacious, modern and somewhat quiet considering the hotel’s location. With this said, it’s still worth packing a pair of earbuds if you’re a light sleeper. As you’d expect for a hotel located on Walking Street, P.72 Hotel is 100% guest friendly, with nice reception staff that will let you bring in guests without any extra fees. All in all, this place is a good low-cost option if you want to spend your nights in the Walking Street bars. Rated 7.4 out of 10 by Agoda users. The Green View is a small but comfortable two star guest friendly hotel that’s located close to Walking Street. This means it’s within walking distance of many of Pattaya’s top go-go bars and beer bars. If you want to be close to the action but far enough away to get a decent night’s sleep, The Green View is a good choice. Rooms here are spacious and comfortable, with soft beds (none of the ultra-firm mattresses that are common in Thailand) and reasonably fast Wi-Fi. Overall, a good choice if you don’t want to spend much but want a reasonably comfortable place to stay and bring new friends back to. Rated 7.4 out of 10 by Agoda users. Located just off Pattaya Second Road, The Siam Guest House is a small but comfortable budget guesthouse with a good selection of rooms. The rooms here are very simple (you can basically find a bed, desk, fridge and TV in each room, without much more) but have private bathrooms and everything else you need for a basic night’s sleep. 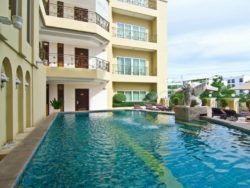 With a good location, high levels of cleanliness and great value for money, this is a good budget option if you want to be close to the center of Pattaya. Just don’t expect a luxury experience. As you’d expect, this hotel is 100% guest friendly, with no joiner fees or any other extra costs for bringing back a guest. Rated 6.9 out of 10 by Agoda users. Sawasdee Siam Hotel is a mid-sized budget hotel located on Soi Honey Inn, just off Pattaya Second Road. From the hotel, it’s about a 10 minute walk into the center of Pattaya, with a good selection of restaurants, bars and other nightlife in the sois near the hotel. Rooms at Sawasdee Siam Hotel are simple and offer enough for a decent night’s sleep, although the hotel itself isn’t anything special. 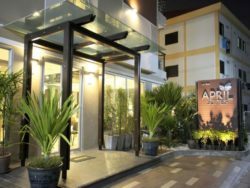 Overall, a little rough around the edges but generally clean and comfortable enough for a good stay if you’re on a budget and want a simple guest friendly hotel near the center of Pattaya’s nightlife area. Rated 6.3 out of 10 by Agoda users. With a great location on Soi LK Metro, Pasadena Lodge Hotel is a convenient, clean and comfortable two star hotel close to the center of Pattaya’s nightlife area. Rooms here are modern and clean, with nice decorating. The hotel is also just a few seconds away from nearby restaurants and bars, making it a very convenient place to stay. All in all, Pasadena Lodge Hotel is a step above most of the other budget hotels around this area. It’s also totally guest friendly, with easygoing staff and no fees to bring guests back to your room. Rated 7.5 out of 10 by Agoda users. Looking for value for money? These three-star hotels offer the best mix of quality and pricing, making them the best option if you want to have fun in Pattaya without spending too much on accommodation. Rated 8.2 out of 10 by Agoda users, April Suites Pattaya is one of the top rated three star hotels in Pattaya. This small hotel is located just off Pattaya Sai 2, within walking distance of Pattaya Beach, Central Festival Pattaya and most of the nightlife along Beach Road and its surrounding sois. 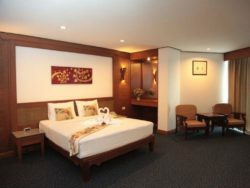 Rooms at April Suites Pattaya are modern and comfortable, with plenty of space to stretch out. 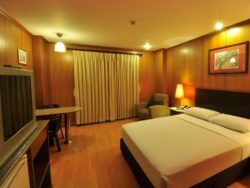 All rooms have large queen or king beds with soft, comfortable mattresses, as well as LCD TVs, desks and fast Wi-Fi. There’s also a rooftop pool with a great view of the city. All in all, a very good place to stay, and completely guest friendly. Rated 8.2 out of 10 by Agoda users. 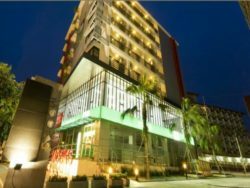 Rated 8.1 out of 10 by Agoda users, August Suites Pattaya is another highly rated three and a half star hotel close to the center of Pattaya. From the hotel, it’s a two minute walk to Beach Road and 5-10 minutes to walk to Central Festival Pattaya and most of the nightlife in the area. Simply put, the location here is very tough to beat. Rooms at August Suites are modern, clean and comfortable, with large beds, sofas and desks in every room. There’s also fast Wi-Fi and plenty of natural light, as well as small balconies for most rooms. The hotel even has a nice swimming pool and a small but well equipped fitness center for guests. Highly recommended and 100% guest friendly. Rated 8.1 out of 10 by Agoda users. Located on Beach Road Soi 8, Eastiny Place Hotel is a large, comfortable three star hotel that’s very close to the nightlife on Soi 6. If you want to be able to walk to the beer bars in under five minutes, this is the place you’ll want to stay. Rooms at Eastiny Place Hotel are spacious (even the smallest are 29 square meters) and comfortably furnished, with large beds, TVs, large windows that let in a reasonable amount of sun and free Wi-Fi. There’s also a good outdoor pool with deck chairs for relaxing during the day. While this definitely isn’t a luxury hotel, it offers good value for money and a location close to Soi 6 that’s difficult to beat. Rated 7.0 out of 10 by Agoda users. Another well located hotel — this time on Beach Road Soi 7 — Eastiny Seven Hotel is a good choice if you want a mid-priced place to stay that’s within walking distance of the bars on Soi 6. Rooms here are large, clean and fitted with comfortable furniture. Some even have nice views of the beach. As you’d expect, the entire hotel is 100% guest friendly. In fact, all of the Eastiny hotels in Pattaya are guest friendly, with nice staff that mind their own business if you bring someone back. There’s also a nice outdoor pool here and free Wi-Fi throughout the hotel, making it a pleasant place to stay during the daytime as well as at night. Just like the other Eastiny hotels, this isn’t a luxury hotel, but it does the job and offers a good location and comfortable room at a reasonable price. Rated 7.1 out of 10 by Agoda users. 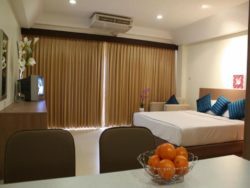 The third Eastiny branded hotel in Pattaya, Eastiny Residence Hotel offers spacious, comfortable apartment-style rooms in a convenient location on Soi 10. From the hotel, it’s a 5-10 minute walk to Soi 6 and less than two minutes to the nearby beer bars. The best aspect of Eastiny Residence Hotel is the size of the rooms. Many of the rooms here are almost 50 square meters in size, giving you plenty of space to relax and unwind. The furniture is a little dated but the beds are large, with soft and comfortable mattresses. As you’d expect for an Eastiny brand hotel, this hotel is 100% guest friendly. The staff are very tolerant and will have no problem with you bringing friends back late in the evening. Rated 7.1 out of 10 by Agoda users. Located right off Beach Road on Soi 8 and just a couple of minutes from Central Festival Pattaya, Eastiny Inn has one of the best locations of any three star hotel in Pattaya. It’s also a comfortable place to stay, with modern and clean rooms that have large beds and all the usual items. The only downside of this hotel is the noise level. It’s located right next to several beer bars, making it a fun place to stay if you want to enjoy the nightlife but less than ideal if you like to sleep early. Recommended if you want to stay out until late, but not if you’re a light sleeper. Rated 6.8 out of 10 by Agoda users. 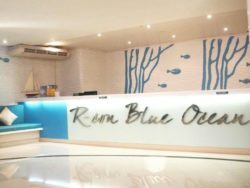 R-Con Blue Ocean Hotel is a modern three star hotel that’s located on Soi Buakhao, one of Pattaya’s top sois for beer bars and casual, easygoing nightlife. The rooms here are modern and even include small kitchens, making this a great place to stay if you want to prepare snacks and some meals in your room. The beds here are comfortable, the rooms clean and the overall comfort level high. With this said, this hotel is starting to show some signs of age and isn’t quite as nice as it was three or four years ago. It’s also in quite a noisy area, making it less than ideal if you like to sleep early. Overall, a decent choice if you want to enjoy the nightlife nearby on Soi Buakhao. Rated 6.4 out of 10 by Agoda users. 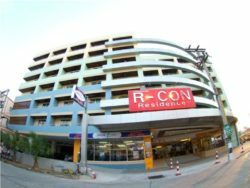 Another option on Soi Buakhao, R-Con Residence has large, modern rooms that feel comfortable and offer everything you need for a good stay. This hotel feels like it was built in the late 90s and looks and has a simple but pleasant atmosphere that makes it a good mid-priced option. The rooms here are spacious and get a good amount of natural light, while the location on Soi Buakhao means you’re close to a lot of great restaurants and bars while still just a short baht bus ride away from Pattaya’s beachside and central nightlife. The only real downsides here are the building maintenance (while the rooms are nice, the hotel itself could do with some new paint) and the minor noise level on the lower floors. Rated 6.8 out of 10 by Agoda users. Located just off Pattaya Second Road, Nova Gold Hotel is a nice three star hotel that offers great value for money. 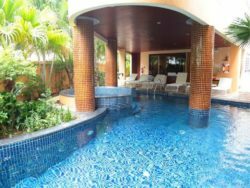 It also has facilities beyond what you’d expect from a hotel in this price range, such as a great swimming pool with plenty of peace and quiet for you to relax beside during the day. Rooms at Nova Gold Hotel are spacious and comfortable, with floor to ceiling windows that let in plenty of natural light and small balconies. The hotel is a short walk from the restaurants and bars on Second Road, as well as Central Festival Pattaya. Overall, one of the best mid-priced three star hotels in Pattaya. Rated 7.8 out of 10 by Agoda users. Another good three star option, Nova Park Hotel has large, modern and comfortable rooms in a great location within walking distance of Second Road. From the hotel, it’s a quick baht bus ride to Beach Road, Central Festival Pattaya, Walking Street and other popular areas. There are also several bars and nightlife options near the hotel itself. Aside from the nice rooms, this hotel has a great swimming pool with plenty of deck chairs set up for you to relax on. There’s even a small but fairly well equipped gym. A great option if you want to have a pleasant stay in Pattaya without spending more than you’d like to. Rated 7.4 out of 10 by Agoda users. With modern rooms and a rooftop pool, Flipper Lodge is a great three star hotel that’s located on Soi 8, a short distance from Central Festival Pattaya and directly opposite Pattaya Beach. 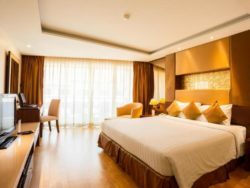 Rooms here are large, modern and comfortable, with huge windows that offer a great view of Pattaya Beach and the city skyline. There’s also a really nice pool with excellent views of Pattaya that’s perfect for sunbathing and relaxing. Like all of the hotels listed on this site, Flipper Lodge is guest friendly and doesn’t charge any joiner fees. Rated 7.6 out of 10 by Agoda users. 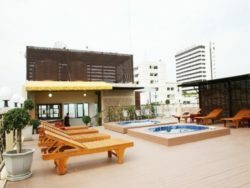 Pattaya Loft is a mid-priced three star hotel located just off Pattaya Central Road. The rooms here are starting to show their age but still offer a reasonable level of comfort, making this a decent place to stay if you have your own transportation. From the hotel, it’s a long walk to anywhere of interest in Pattaya, meaning you’ll need to use the baht bus or rent a scooter. 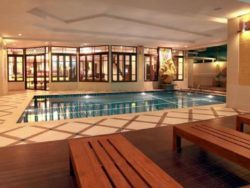 In terms of facilities, Pattaya Loft has a small outdoor swimming pool and a spa. Overall, a decent hotel, although nothing particularly special. Rated 6.9 out of 10 by Agoda users. 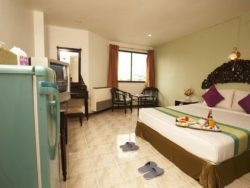 Located just off Pattaya Second Road near Soi 13, Dynasty Inn Pattaya is an affordable three star hotel in a great location. From the hotel, it’s a five minute walk down the soi to get to the beach and a similar distance to most of the area’s nightlife. There are numerous restaurants around this hotel, as well as plenty of beer bars for having fun and meeting new people. Rooms here are simple but comfortable, with queen-sized beds, work desks and other useful furniture. While there’s no swimming pool here, there is a relaxation area on the top floor with a jacuzzi and great views of Pattaya Beach. Recommended if you want an affordable hotel in a good location near Pattaya’s best dining and nightlife. Rated 8.0 out of 10 by Agoda users. Sabai Inn is a three star hotel located on Pattaya Soi 2, meaning it’s less than five minutes walk along Beach Road to the infamous nightlife on Soi 6. 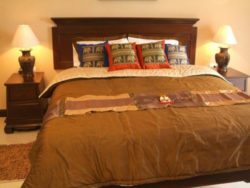 Rooms here are big, comfortable and fitted with large, queen size beds with soft and relaxing mattresses. Sabai Inn has an outdoor pool with deck chairs and umbrellas for relaxing during the day, as well as fast free Wi-Fi throughout the hotel. There’s also a small restaurant and bar in the hotel that serves good Thai and international food, plus reasonably priced cocktails. This is a three star hotel and as such doesn’t offer incredible luxury, but it’s definitely a comfortable place to stay. Plus, the location close to Soi 6 and a short baht bus ride from Central Festival Pattaya is a big benefit. Rated 7.8 out of 10 by Agoda users. 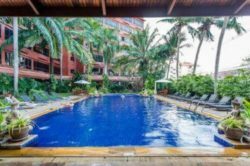 Located close to the corner of Soi 13/1 and Second Road, The Privi Hotel has a great location that’s within walking distance of Beach Road and Walking Street, as well as Central Festival Pattaya. There’s plenty of nightlife around the hotel, although nothing too noisy or crazy within earshot. The rooms here are modern and comfortable, with large bathrooms and extra features like Whirlpool bathtubs in some of the larger rooms. There are also some small plunge pools on the rooftop, plus deck chairs for sunbathing and relaxing on. Overall, this hotel definitely lives up to expectations and offers great value for money. A big hotel located just off Second Road, Royal Palace Hotel has a garden-style setting with great facilities such as a large swimming pool, plenty of deck chairs and poolside furniture, and a peaceful, chilled out atmosphere. Built in the 90s, this hotel isn’t super modern but still offers all of the comforts you need for a pleasant stay. The rooms have huge beds, large living areas and small balconies overlooking the pool area. There’s a restaurant on site and a good buffet breakfast. A good choice if you want to stay in a large hotel within walking distance of Walking Street, Beach Road and other hotspots without paying a fortune for your room. Rated 7.2 out of 10 by Agoda users. 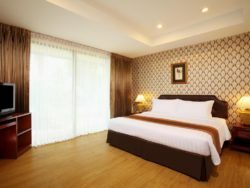 The Pinewood Residence is a serviced apartment located on Second Road, a short walk from Pattaya Soi 6 and Beach Road. It’s also 5-10 minutes by baht bus to Central Festival Pattaya and Walking Street, making this a well located hotel on the whole. The rooms here are apartment units, with full kitchens including stoves, microwaves and everything else you need for a “living in Pattaya” experience. The furniture is good and the decorating nice, with large queen size beds, comfortable bedding and a comfortable feel overall. The hotel and units feel slightly dated but are still great value for money. All in all, a good place to stay, especially if you’re in Pattaya for a longer visit and want the conveniences of an apartment. Rated 6.9 out of 10 by Agoda users. Another serviced apartment, Mooks Residence offers mid-sized and comfortable modern apartment units with large beds, microwaves, sinks, dishes and everything else you need for day-to-day life. The rooms here are very modern and the building itself a nice place, with a convenient cafe downstairs. Location wise, Mooks is a little far from the center of Pattaya, meaning you’ll need to spend 5-10 minutes in the baht bus getting to and from Beach Road, Central Festival Pattaya, Walking Street and other hub areas. With this said, this is an excellent place to stay if you have your own transportation or don’t mind using the cheap and easy baht buses to get around Pattaya. Rated 7.7 out of 10 by Agoda users. Located right beside Central Festival Pattaya, Basaya Beach Hotel & Resort is one of the best located mid-priced guest friendly hotels in Pattaya. From the hotel, it’s a short walk to the shopping mall and a simple five-minute walk to the beer bars and go-go bars on Soi 6. One huge advantage of Basaya is that the rooms are really big. The standard rooms here are a compact 24 square meters, but the superior rooms and suites start from 40 square meters and go up to 84 square meters in space. The furniture is stylish, the beds are comfortable and large, and the rooms all get a good amount of sunlight during the day. 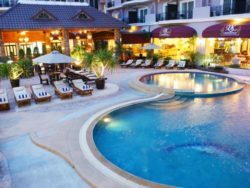 There’s also free Wi-Fi, a huge outdoor pool and nice facilities for guests, making this one of the best guest friendly hotels in the area surrounding Central Festival Pattaya. Rated 7.2 out of 10 by Agoda users. Twin Palms Resort is a large resort-style hotel on Beach Road, with a great location close to Soi 6 and a short walk or baht bus ride away from Central Festival Pattaya. If you want a relaxing place to stay that’s near the heart of the action (but still quiet enough for a good night’s sleep), this is a good choice. Rooms at Twin Palms are big, clean and nicely furnished with queen size beds and a small desk. 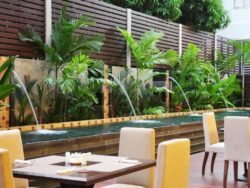 The hotel has garden surroundings which make it a peaceful and relaxing place to stay in general. There’s also free Wi-Fi, a huge outdoor pool and Pattaya Beach less than 30 seconds away on foot. All in all, one of the best value for money options in the area. It’s also 100% guest friendly, with no joiner fees for new people you meet while staying in Pattaya. Baywalk Residence is an upmarket three star hotel located right on Beach Road, a short five-minute walk from Walking Street and an easy baht bus ride away from the nightlife on Soi 6. There’s a great rooftop swimming pool here that’s perfect for relaxing during the day, plus spacious rooms with large windows and plenty of natural light. Some of the higher end rooms even have sea views. One huge advantage of this hotel over other three star hotels on Beach Road is that it’s very modern. The rooms are clean and simple but have modern queen beds, decent sized bathrooms, bathtubs and other features that aren’t always easy to find in this price range. There’s also free Wi-Fi and decent room service. Baywalk Residence is 100% guest friendly, with no joiner fees to worry about and friendly reception staff that have no problems with you bringing friends back to your room. Rated 7.4 out of 10 by Agoda users. Summer Spring Hotel is a modern three star hotel just off Beach Road, less than a minute from Pattaya Beach and 10 minutes walk from Soi 6. Thanks to the rooftop pool, it’s also an awesome place to relax during the daytime and enjoy a casual drink in the evening before you go out. From the hotel, it’s easy to get to Walking Street on the baht bus or walk to Soi 6. There are also numerous beer bars around the hotel. Rooms at Summer Spring Hotel are very big, with the smallest rooms starting at 41 square meters and the larger ocean view suites offering more than 80 square meters of space. The beds are large and mattresses soft, furniture modern and indoor spaces clean and well maintained. Overall, this place is highly recommended if you want to be close to the beach and a short walk from nightlife. The noise level is low, making it easy to get a good night’s sleep. There’s also a nice poolside bar for relaxing as the sun sets. Like all hotels on this website, Summer Spring is 100% guest friendly. Rated 7.5 out of 10 by Agoda users. Bella Villa Prima Hotel is located just off Pattaya Soi 4, meaning you can get to Beach Road in just a few minutes and Soi 6 in under five minutes. This hotel is rated three stars and has spacious, comfortable rooms with king size beds. It’s not a luxury property by any means, but it’s definitely a pleasant place to stay. Most rooms look out over the soi, with a small balcony that you can relax on as the sun sets. The bathrooms are large and include bathtubs, which is rare for a mid-priced hotel in Pattaya. There’s free Wi-Fi throughout the hotel, an outdoor pool and even a sauna for sweating out last night’s drinks. Bella Villa Prima Hotel is 100% guest friendly, with no joiner fees for guests and an easygoing reception team that offer welcoming service. Easily one of the best options on Soi 4. Rated 7.9 out of 10 by Agoda users. If you want guest friendly accommodation with a full kitchen and other apartment-style amenities, you’ll like The Whitehouse Condotel. This condominium/hotel complex has spacious suites with full kitchens, plates and cutlery, letting you prepare food and home and enjoy all of the comforts of a modern apartment. As well as the apartment-style conveniences and large living spaces, units at The Whitehouse Condotel have large queen and king-size beds, comfortable bedding and large windows that let in plenty of natural light, giving the place a roomy and welcoming feel. The furniture is modern and the decorating tasteful. There’s also a rooftop pool with deck chairs for relaxing during the day and evening. The Whitehouse is located on Soi 13, just off Beach Road and a short walk from Walking Street. There are several beer bars less than two minutes from the hotel, making it a good place to stay if you want to enjoy a drink nearby. As you’d expect for the area, this hotel is totally guest friendly and has no joiner fees for companions. Rated 8.0 out of 10 by Agoda users. Baan Sila is a modern three star hotel locate on Soi 11, just off Beach Road. 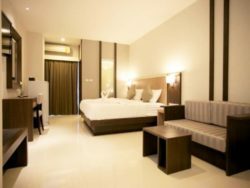 The rooms here are clean, comfortable and furnished with large beds with reasonably soft mattresses (they’re definitely not the ultra-firm mattresses you get in some hotels in Pattaya). The rooms get plenty of natural sunlight and feel very pleasant to stay in during the day. There are also some premium rooms available here with floor-to-ceiling windows and small balconies. There’s free Wi-Fi throughout the hotel, an outdoor pool and a quick two-minute walk to the beach. From Baan Sila, it’s a quick baht bus ride to Soi 6 or Walking Street, making it easy to get to the nightlife. All in all, this is another good guest friendly accommodation option if you want to be close to Pattaya Beach. The staff are nice and will not bother you if you bring a new friend back to the hotel, even late at night. Rated 7.1 out of 10 by Agoda users. 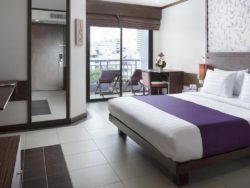 The Ibis Pattaya is a clean and comfortable three star hotel located on Second Road, meaning it’s a short baht bus ride away from things like Central Festival Pattaya, Pattaya Beach and the nightlife on Soi 6 and Walking Street. The area around the hotel is calmer and quieter than the rest of Pattaya, meaning you’ll get a better night’s sleep here than in a hotel closer to Walking Street or Beach Road. Rooms here are exactly what you’d expect from an Ibis property — clean, well equipped and modern. There’s a nice outdoor pool with deckchairs and umbrellas for relaxing during the day, as well as a bar and restaurant. Overall, the hotel feels very nice and modern, with large waiting areas and a stylish lobby. Like all of the hotels on our list, the Ibis Pattaya Hotel is a guest friendly hotel with no joiner fees for guests. 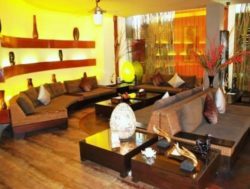 The staff are easygoing and helpful, making this a good place to stay if you’re visiting Pattaya on a moderate budget. Rated 7.7 out of 10 by Agoda users. Aside from the ridiculous name (seriously, who calls a hotel “Baboona”?) this is a really great guest friendly accommodation option. Baboona Beachfront Living Hotel is located on North Pattaya Beach Road, a short walk away from the bars on Soi 6 and a quick baht bus ride away from Central Festival Pattaya and Walking Street. For a three star hotel, Baboona is extremely luxurious. 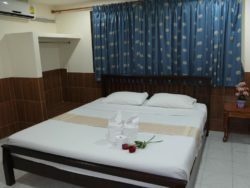 The rooms have modern furniture and large, soft and comfortable beds. There are LCD TVs in every room with a good selection of channels. There’s fast, free Wi-Fi and large windows to make sure the rooms get plenty of natural light and never feel too stuffy. Add a selection of ocean view suites into the mix (trust us – they’re worth paying a little extra for) and a convenient on-site spa and this is one of the best hotels near Soi 6 worth staying in. It’s also totally guest friendly, with no extra fees for bringing a friend back to your room. Rated 8.2 out of 10 by Agoda users. Seven Zea Chic Hotel is an upmarket but affordable 3.5 star hotel located on Soi 5, an easy walk away from the nightlife on Soi 6 and close to a variety of popular beer bars and restaurants. 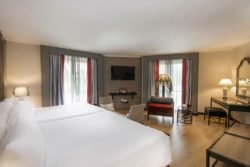 This hotel is very modern, with luxurious rooms featuring floor to ceiling windows, large king size beds and a small work desk for reading or browsing the internet. There’s also fast, free Wi-Fi in all rooms and a rooftop swimming pool with good views over Pattaya city and the beach. One nice aspect of this hotel is the bathrooms, which are very spacious and modern, even featuring luxurious bathtubs. All in all, this is a great hotel for the money and 100% guest friendly, meaning you can bring your friends back without any worries. Rated 7.7 out of 10 by Agoda users. Another luxurious 3.5 star hotel, Sea Me Spring Too Hotel has a quiet location on Soi 10 between Beach Road and Pattaya Second Road, a short walk from Central Festival Pattaya. The hotel is near several popular beer bars, making it easy to walk out of the hotel and enjoy Pattaya’s nightlife within a few minutes. You can also get to Central Festival Pattaya in under five minutes by walking along Beach Road. Along Soi 10, you can find a good selection of bars and places to hang out, as well as some Thai and international dining options. It’s also a quick baht bus ride to Soi 6 and Walking Street, making it easy to get around from the hotel. Rooms here are spacious, modern and comfortable, with huge beds and free Wi-Fi, as well as floor to ceiling windows with good views of the beach. As you’d expect, Sea Me Spring Too Hotel is 100% guest friendly and the staff have no problem with you bringing someone back to your room. Rated 7.9 out of 10 by Agoda users. One of Agoda’s top rated hotels for 2016, KTK Royal Residence is a great three star hotel that’s located on Soi Pattaya Klang 12. From the hotel, it’s a 10-15 minute walk or five minute baht bus ride to places like Walking Street, Central Festival Pattaya and Beach Road. Rooms here are modern, spacious and clean, with new bathrooms and small kitchens inside some rooms. 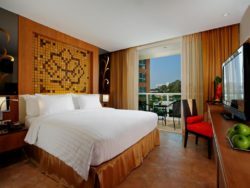 The furniture is stylish and modern, the beds gigantic and mattresses soft, and the overall feel of the hotel very nice. There’s also a large swimming pool and gym for guests, both of which are high quality. 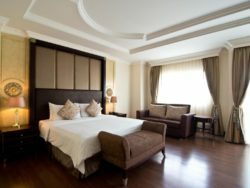 Overall, this hotel offers great value for money and a more luxurious experience than you’d expect for a three star hotel. Rated 8.0 out of 10 by Agoda users. 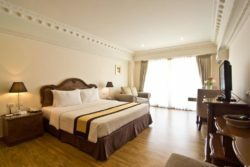 Another cheap and simple three star hotel, Grand Hotel Pattaya is simple but clean and comfortable enough for a nice stay. The rooms here have large queen size beds and small balconies overlooking Soi 14, meaning you can relax and enjoy the fresh air during the day. 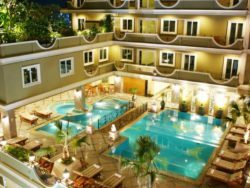 Grand Hotel Pattaya is a short walk from Walking Street and a quick baht bus ride away from the nightlife on Soi 6, making it a good option if you want to be close to both entertainment areas. There are no fees for bringing guests back to your room and the staff are friendly but mind their own business. Rated 7.4 out of 10 by Agoda users. If you want to be right on Walking Street, Galaxy Suites Pattaya Hotel is the place you’ll want to stay. 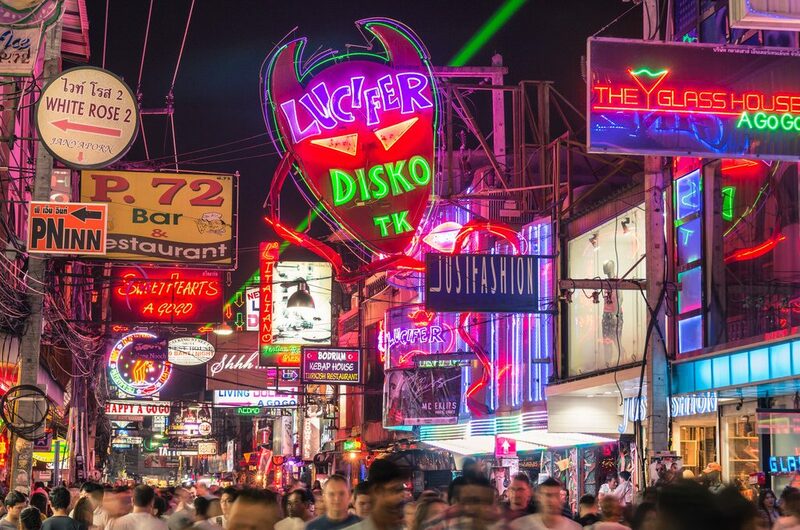 This hotel is located directly on Walking Street, meaning you’re never more than a couple of minutes away from Pattaya’s most popular go-go bars, beer bars and nightclubs. Despite the location, Galaxy Suites is a surprisingly comfortable place to stay, with a tolerable noise level and comfortable rooms with modern furniture and good cleaning. Some rooms also have large jacuzzis, which can be fun if you come back from a night out with a new friend. If you’re looking for a simple, well located and comfortable place to stay while you have fun on Walking Street, Galaxy Suites Pattaya Hotel is tough to beat. As you’d expect for a hotel on Walking Street, Galaxy Suites is a guest friendly hotel with no joiner fees for bringing someone back to your room. Intimate Hotel is technically a 3.5 star hotel, but its facilities and rooms are much closer to a high quality four star hotel. If you don’t mind stretching your budget a little further, it’s worth paying for the upgrade compared to places like The Green View or Grand Hotel Pattaya. Facilities at Intimate Hotel include a large rooftop pool and spacious, nicely decorated rooms with huge beds. Some of the larger rooms even feature jacuzzis, which make for a great experience. There’s fast, free Wi-Fi in all rooms and all of the modern items you’d expect from a nice hotel. In terms of location, Intimate Hotel is on Second Road, meaning you’ll need to walk for a few minutes to get to the beach. It’s also a short baht bus ride to Soi 6, Walking Street and other nightlife areas. All in all, this hotel and its location are really good and worth considering if you want something a bit more luxurious than the usual three star options without a big price tag. Rated 8.2 out of 10 by Agoda users. Areca Lodge Hotel is another 3.5 star accommodation option with a location just off Second Road. It’s a luxurious hotel with a large outdoor pool and big, comfortable rooms with modern furniture. I would compare this more to a 4 star hotel than a 3.5 star hotel, so it’s an excellent value for money choice if you want a more luxurious experience. Rooms at Areca Lodge Hotel start at 32 square meters, so you get plenty of space to stretch out and relax in. The beds are big (I would guess Queen or King size) and the mattresses are soft, supportive and comfortable. The Wi-Fi is fast and easy to pick up anywhere in the hotel. Like every hotel on our list, Areca Lodge Hotel is 100% guest friendly and has no fees for joiners. The staff are easygoing and will mind their own business if you come back with a guest, meaning you won’t feel bothered at all while staying here. One of the best mid-price choices around Second Road. Rated 8.1 out of 10 by Agoda users. Located on Soi Buakhao, LK Royal Suite Hotel is a modern 3.5 star hotel that has large, comfortable rooms and two swimming pools. 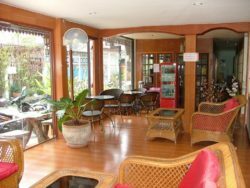 This hotel is priced well and offers great value for money, provided you want to be in the busy Soi Buakhao area. Outside the hotel, you can find a good selection of small bars and restaurants, with easy access via baht bus to the center of Pattaya. As well as the usual standard rooms, this hotel has spacious suites with separate living area, Jacuzzis and other nice features. Even the regular rooms are 36 square meters, meaning you have lots of space to stretch out, relax and feel at home. Aside from the nice rooms, which have huge windows and modern furniture, this hotel has great facilities. There are two swimming pools in a courtyard area, as well as a well equipped gym for guests. One of the best three-and-a-half star hotels in Pattaya and a recommended option if you want to be located around Soi Buakhao. Rated 7.8 out of 10 by Agoda users. Camelot Hotel is a large, slightly older three star hotel located within walking distance of Walking Street. The hotel itself is big, with an outdoor pool and a spacious lobby and several restaurants. Overall, it feels a little dated and the rooms are definitely in need of a little TLC. With that said, Camelot Hotel is still a decent place to stay if you want a cheap and fairly comfortable room in a good location. It’s less than 300 meters to the beach, a few minutes to Walking Street, a very quick walk to the baht bus stops and generally a convenient hotel. It’s also 100% guest friendly, with no joiner fees for anyone you meet in Pattaya. Add free Wi-Fi in all rooms and Camelot Hotel is a decent option, provided you can tolerate the slightly dated decorating. Rated 7.2 out of 10 by Agoda users. Naris art Hotel is a great option if you want a guest friendly hotel that’s away from the noise, hustle and bustle of Walking Street. This hotel is located on Thappraya Soi 5, meaning it takes 5-10 minutes to get to Walking Street in a baht bus. The journey is short and the location is actually really convenient, since there are lots of nice cafes and restaurants around the hotel. Naris Art Hotel has a nice outdoor swimming pool that’s perfect for relaxing during the daytime. The rooms are reasonably big (even the smallest rooms are around 25 square meters) and have free Wi-Fi, soft and supportive mattresses and big beds that make getting a good night’s sleep easy. This hotel is really quiet compared to most in Pattaya, especially considering it’s only 5-10 minutes to Walking Street. As you’d expect, Naris Art Hotel is 100% guest friendly and the staff will not bother you if you bring back a new friend. One of the best options in Pattaya if you want guest friendly accommodation that’s away from the noise. Rated 7.3 out of 10 by Agoda users. 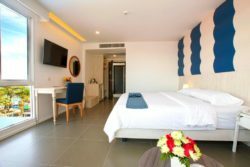 Sunshine Hotel & Residences is a three star hotel located right on Soi 8, making it one of the best places to stay in Pattaya if you want to be close to the infamous nightlife on Soi 6. It’s also less than 200 meters to the beach, which is a nice benefit if you want to get some sun during your time in Pattaya. Rooms at Sunshine Hotel & Residences are fairly spacious, with even the smallest rooms offering at least 25 square meters of space and large queen-size beds. The furniture is fairly modern and the beds are soft and comfortable. There’s free Wi-Fi throughout the entire hotel and the connection speed is fast. Since this hotel is on Soi 8, it should come as no surprise that it’s 100% guest friendly and the staff are completely used to having guests bring back new friends late at night. Rated 7.4 out of 10 by Agoda users. Royal Twins Hotel is a huge three star hotel on Pattaya Second Road. 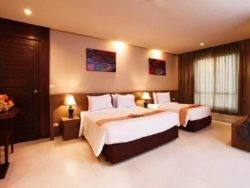 Built in the 90s and renovated over the years, this hotel has much bigger rooms than some of Pattaya’s newer budget hotels, with even the smallest rooms exceeding 40 square meters. It also has great facilities, with a huge swimming pool and plenty of outdoor space for you to relax in and enjoy the weather. Rooms at Royal Twins are spacious and comfortable, but feel a little dated. If you don’t mind the 90s/early 2000s decor, this is a great place to stay. The beds are huge and the rooms have large windows and balconies giving you plenty of natural light. With this said, the mattresses are a little on the hard side, but the staff can provide a soft topper if you ask. A good deal if you don’t need somewhere super modern and want a hotel with a great swimming pool. Rated 7.3 out of 10 by Agoda users. Another large three star hotel, Welcome Plaza Hotel was built in the 90s and offers a huge amount of space and great facilities for guests. Like most older hotels in Pattaya, the rooms here are more spacious than what you’d get in a new hotel, with even the smallest rooms featuring private balconies and plenty of living space. Rooms here are decorated with basic furniture and have all of the features you’d expect, from a TV to desk, king-sized bed and more. The bathrooms are pretty dated but include a bathtub, which is a nice plus compared to the tiny bathrooms in most newer three star hotels. There’s also a huge outdoor pool and poolside bar for guests. If you like large hotel facilities and can tolerate dated design, this is a decent place to stay. Rated 6.3 out of 10 by Agoda users. Another quiet option, Diamond City Place Hotel is located about 10 minutes from Soi 6 and Central Festival Pattaya by baht bus and five minutes from Walking Street. If you don’t like loud noises and want a quiet night’s sleep, you’ll enjoy staying here much more than any of the options in Central Pattaya. Rooms at Diamond City Place Hotel are very spacious, with even the smallest rooms offering 30 square meters or more of living space. The beds are large and the Wi-Fi is reasonably fast, making the rooms a comfortable place to spend the day. There’s a small outdoor swimming pool at the hotel and a restaurant on site. One other nice feature of this hotel is that most of the rooms have bathtubs, which aren’t always easy to find in Pattaya. All in all, a good option if you want to be close enough to Walking Street and Central Pattaya but far enough away to avoid the noise. Rated 7.5 out of 10 by Agoda users. 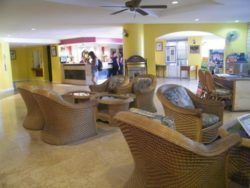 If you want to be in the center of the action, Lido Beach Hotel is a great place to stay. This three star hotel is located right off Walking Street, meaning you never need to walk for more than a couple of minutes to get to Pattaya’s best go-go bars and nightclubs. Rooms here are clean and furnished with large beds, comfortable mattresses and all of the features you need for a pleasant stay. While it isn’t a luxury hotel, Lido Beach Hotel definitely ticks all the right boxes. One thing to note about this hotel is that there’s no pool, so if you’re planning to swim while in Pattaya, you’ll want to pick somewhere else. The rooms closest to Walking Street can also get a little noisy, so it’s best to ask for a room further back from the street if you want to sleep early. The entire hotel has free Wi-Fi, including in all rooms. It’s also 100% guest friendly, with nice staff who will happily let you bring back new friends to your room. The only real downside of this hotel is that it’s starting to look slightly dated. If you want an ultra-modern hotel with brand new everything, it might not be a good choice. However, if you want a pleasant place to stay near Walking Street at a reasonable cost, Lido Beach Hotel fits the bill nicely. Rated 7.0 out of 10 by Agoda users. 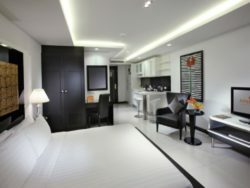 W 14 Hotel Pattaya is one of our top recommended three star guest friendly hotels in Pattaya. This hotel is extremely new, very clean and offers small but highly comfortable rooms in an excellent location just off Walking Street. If you want to stay near Walking Street on a modest budget, this is the hotel to choose. Rooms at W 14 Hotel Pattaya are slightly on the small side, measuring at 23 square meters. However, they feel spacious and comfortable thanks to the large windows and high quality furniture. All rooms have large LCD TVs, queen or king beds with comfortable mattresses and soft, high quality bedding, plus free Wi-Fi. 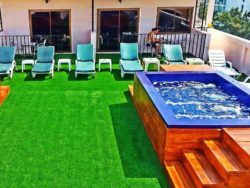 There’s also a small rooftop pool with deck chairs for relaxing and enjoying the sun, as well as a high quality cafe serving coffee, tea, croissants, sandwiches, ice cream and other food in the lobby. Easily our highest recommended guest friendly hotel near Walking Street. Rated 8.6 out of 10 by Agoda users. LK Residence is a nice 3.5 star hotel that’s located on Pattaya Saisong 13, a short walk away from Central Festival Pattaya and Beach Road. Rooms here are spacious and decorated nicely, with large queen beds, comfortable furniture, desks, LCD TVs and all of the other features you’d expect from a modern, mid-priced hotel. As well as the comfortable rooms, there’s a swimming pool with a good view of the surrounding area and a good selection of poolside chairs for you to relax on. From the hotel, it only takes a minute or two to walk to nearby dining and bar options, making this a fun place to stay if you want a comfortable but affordable experience close to the nightlife. Rated 7.9 out of 10 by Agoda users. Pattaya has lots of four star hotels that allow guests, usually without any extra fees. 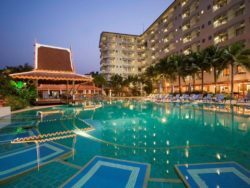 We’ve listed the best four star guest friendly hotels in Pattaya below, with all the information you need on location, room size, facilities and general quality. 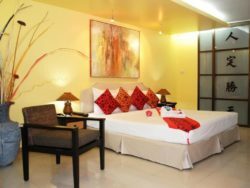 LK The Empress is one of the best reasonably priced four star hotels on Beach Road that’s also guest friendly. The rooms here are large (even the smallest are 36 square meters), luxurious and well fitted with modern furniture and king size beds with soft mattresses for a pleasant night’s sleep. The bathrooms all feature huge bathtubs with marble tiling and the general aesthetic is very upmarket and luxury. Some of the rooms also have great views of the beach. It’s best to pay a little extra for a beach view room, as the balconies offer great views over Pattaya Beach and make for a relaxing spot to enjoy your morning cup of coffee. Facilities include a large outdoor pool with reclining deck chairs and umbrellas, making it easy to relax and enjoy the Pattaya sun. There’s also a small gym with treadmills and some basic weight training equipment. LK The Empress is a 100% guest friendly hotel, with no extra fees for new friends you meet in Pattaya. Highly recommended if you’re looking for a luxurious place to stay without spending big on a five-star hotel. Rated 8.3 out of 10 by Agoda users. Another “LK” hotel (there are a few in Pattaya), LK Metropole has spacious, comfortable rooms that are decorated like something you’d see in Las Vegas or Monaco. If you like luxurious, high end furniture and palace-like decorating, you’ll enjoy staying here. The huge outdoor pool and relaxing courtyard also add to the experience. This is a very fun hotel for entertaining guests and enjoy a real Pattaya getaway experience. From a location standpoint, LK Metropole Hotel is in a good area. From the hotel, it only takes 10 minutes to walk to Central Festival Pattaya or Beach Road. It’s also surrounded by excellent local and international restaurants, giving you plenty of eating options. There are numerous beer bars, cafes and small bars around the hotel with people to meet and things to do. All in all, a great mid-priced four star hotel in an excellent location. Rated 7.9 out of 10 by Agoda users. Aya Boutique Hotel Pattaya is another good four star hotel option located on Beach Road. With modern rooms and a convenient location, this is a good place to stay if you want to be a short baht bus ride away from places like Walking Street, Soi 6, Central Festival Pattaya and all of the beer bars on Beach Road and Pattaya Second Road. Rooms at Aya Boutique Hotel are modern and comfortable, with queen size beds and all of the comforts you’d expect from a four star hotel. Overall, they don’t feel quite as luxurious as LK The Empress, which has more of a glitzy feel to it. Still, it’s a comfortable place to stay and the great facilities (including a semi-indoor swimming pool) make it unique for a four star hotel in Pattaya. Just like the other hotels on our list, Aya Boutique Hotel Pattaya is a guest friendly hotel with no joiner fees. You can bring back guests to your room without any problems, and the staff are friendly and easygoing about visitors. Rated 7.8 out of 10 by Agoda users. 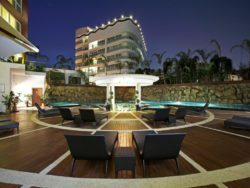 Another centrally located four star hotel, Centara Nova Hotel & Spa Pattaya is set back a little bit further from the beach, with a location on Pattaya Klang Soi 12 that puts it near the center of the city. From the hotel, it’s about 5-10 minutes in a baht bus to Central Festival Pattaya and 10 to 15 to Walking Street, or less than five minutes to Beach Road. 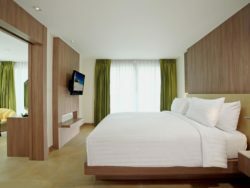 Rooms at Centara Nova are modern and luxurious, with LCD TVs, large beds, workdesks and all of the other items you’d expect in a hotel of this quality level. In terms of facilities, there’s a large outdoor swimming pool with poolside bar and plenty of chairs for you to relax and sunbathe in, plus a fitness center and hotel spa. All in all, a great place to stay if you don’t mind using baht buses to get around Pattaya. Rated 6.5 out of 10 by Agoda users. 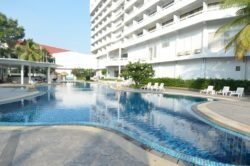 Located just cross Second Road from Soi 6, Centara Pattaya Hotel has a great location close to the beach and nightlife. 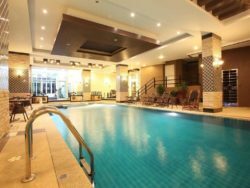 This is a pretty standard four star hotel with all of the benefits you’d expect from a hotel in this price range, from large and comfortable rooms to a great outdoor swimming pool and small but usable fitness center. From the hotel, it’s a five minute walk to Pattaya Beach and five to 10 minutes in the baht bus to get to Central Festival Pattaya, Walking Street and other popular areas. A great place to stay if you want to be close to Soi 6 and enjoy four star comfort without spending too much. Rated 7.6 out of 10 by Agoda users. 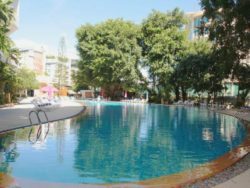 One of the biggest four star hotels in Pattaya, the Mercure Pattaya has a great location just off Second Road and a short walk away from the nightlife on Soi Buakhao. From the hotel, it’s a five minute walk to Beach Road and five to 10 minutes to Walking Street, making it easy to access Pattaya’s nightlife without relying on public transport. Rooms at the Mercure are clean and comfortable to stay in, although the hotel has a bit of a late 90s/early 2000s feel to it and could do with an update. Facilities include a gigantic outdoor pool and well equipped fitness center, plus a great in-house spa for guests. A good option if you’re looking for a comfortable but not overly expensive four star hotel that’s within walking distance of Pattaya Beach and the nightlife. Rated 7.6 out of 10 by Agoda users. Previously called Siam Bayview Hotel, The Bayview Hotel Pattaya is an older four star hotel that’s recently been renovated to modern standards. Because this is an older building, it has a lot of great facilities that new four star hotels in Pattaya are missing, such as a gigantic outdoor pool area, large garden-style grounds, a surprisingly big fitness center and kid’s play club with water slides and other fun equipment. Rooms at The Bayview Hotel are very spacious, with large windows that let in plenty of natural light to give the hotel a comfortable feel. The beds are large and comfortable, the rooms have great balconies overlooking Pattaya City or Pattaya Beach, and there’s fast, free Wi-Fi and a small work desk inside each room for browsing the internet. The bathrooms are also large and feature full-size bathtubs — a rarity in Thailand. The Bayview Hotel is totally guest friendly, with no extra fees for bringing a guest back to your room. The staff are completely used to people bringing guests back late at night and definitely won’t bother you or your friend. Add a great location on Beach Road close to Central Festival Pattaya into the equation and this is a great place to stay if you want to enjoy Pattaya’s shopping, beach and nightlife. Rated 7.9 out of 10 by Agoda users. Another four star hotel located right on Beach Road, the Tropicana Hotel has spacious rooms and suites, garden-like surroundings and a large pool for relaxing in during the daytime. It’s also very close to Soi 6 and the beer bars of the area, making it a good choice if you want to enjoy the nightlife as well as the beachfront. Compared to most four star hotels in Pattaya, the Tropicana Hotel is a little on the older side. The rooms are spacious and highly comfortable, but don’t have the modern feel like a lot of other Thai hotels do. This is reflected in the pricing, as this is one of the cheapest hotels with four star quality facilities in the area around Beach Road. Aside from the age of the hotel, the Tropicana is a nice place to stay. The rooms are very spacious and feel comfortable, with large beds and free, fast Wi-Fi. If you’re looking for a budget four star hotel on Beach Road, a short walk from the nightlife, you’ll like staying here. It’s also 100% guest friendly, meaning you can bring friends back to your room without any problems. Rated 7.1 out of 10 by Agoda users. If you’re looking for a stylish, unique guest friendly hotel in Pattaya, it’s hard to beat the Hard Rock Hotel. This four star hotel offers luxurious facilities and the classic rock style that the Hard Rock brand is known for, with cool features like rock-inspired artwork and funky furniture inside the rooms. Aside from the aesthetic, the Hard Rock Hotel Pattaya is a great place to stay. The rooms are large and comfortable, with modern decorating and huge, comfortable beds. The facilities include a gym, pool, executive lounge, several bars and a selection of restaurants. This is a big hotel with everything you could possibly need during your stay. It’s also totally guest friendly, with nice staff that will not bother you if you want to bring a guest back to your room. Rated 8.3 out of 10 by Agoda users. Located right on Beach Road, the Holiday Inn Pattaya is a modern four star hotel with big, stylishly furnished rooms and great facilities. If you want somewhere modern and upmarket but don’t want to pay five-star prices, this is a good choice. There’s a large outdoor pool with views of the beach, big rooms and suites with great beds, fast Wi-Fi, several restaurants and bars, plus everything else you would expect from a four star international hotel. If you’re visiting Thailand for the first time and associate the Holiday Inn brand with cheap, basic hotels, you should know that in Thailand it’s much more upmarket. Expect luxurious facilities here, not the usual basic stuff. The Holiday Inn Pattaya is about five minutes from Soi 6 on the baht bus, 5-10 minutes from Central Festival Pattaya and 10 minutes from Walking Street. Since it’s at the quiet end of Beach Road, you can get a good night’s sleep without any unwanted noise, all while still being a short distance away from the nightlife. And yes, it’s 100% guest friendly with no unwanted joiner fees. Rated 8.5 out of 10 by Agoda users. Page 10 is a luxurious four star hotel located close to the center of Pattaya. From the hotel, it takes less than five minutes to walk to Central Festival Pattaya and about 10 minutes to Walking Street, making it perfectly located for getting around the city and enjoying the shopping and nightlife. The entire hotel is decorated in a modern style, with sleek furniture throughout the lobby and rooms. All of the rooms have large king size beds, modern wood paneling on the walls and spacious, modern bathrooms with stylish granite tiling. The windows are floor to ceiling and provide plenty of natural light, making this a very pleasant place to stay. There’s fast, free Wi-Fi throughout the entire hotel and a fantastic rooftop swimming pool, complete with reclining deck chairs and a pool side bar for you to enjoy a cocktail or beer while watching the sun set. Page 10 Hotel is a guest friendly hotel with no joiner fees, making it simple to bring back a friend for the night. If you prefer apartment-style accommodation to a luxury hotel, At Mind Serviced Residence is a great place to stay in Pattaya. This serviced apartment complex features full apartment amenities, with cooking equipment, plates and kitchen utensils inside every unit. There are also large dining tables, huge living spaces and everything you’d expect from a luxury apartment. Outside the rooms, there’s a large swimming pool and a nice garden-style environment. 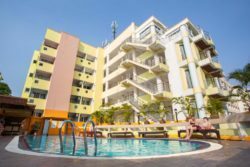 The whole complex is located just off Second Road, meaning you can walk to Soi 6 in about five minutes and use the baht bus to get to Walking Street, Central Festival Pattaya and other places fairly quickly and easily. If you prefer a little more privacy, larger living spaces and apartment-style features, At Mind is a great place to stay. It’s 100% guest friendly and has easygoing, friendly staff, meaning it’s no problem to bring back friends and partners to your room at any time of day. 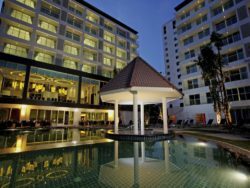 One of two Amari hotels in Pattaya (the other is the five star Amari Ocean on Beach Road), the Amari Nova Suites Pattaya is a modern four star hotel located just off Central Pattaya Road. A nice feature of this hotel is that all of the rooms are suites with separate living areas, even the smallest One Bedroom rooms. The rooms here are comfortable and modern, with huge beds and soft, comfortable mattresses that make sleeping easy. There’s fast Wi-Fi, useful kitchen areas in every room and a fantastic rooftop swimming pool. The only downside is the location — from the hotel, it’s five to 10 minutes to get to Beach Road, Walking Street and the nightlife, depending on traffic. A good option if you’re looking for value for money and don’t mind using the baht buses to get around Pattaya. Rated 8.0 out of 10 by Agoda users. The Imperial Pattaya is a large four star hotel on Second Road with huge grounds, making it a good place to stay if you like the grand hotel experience. The hotel itself is gigantic, with a spacious lobby, garden-like grounds and several large swimming pools. It’s also a little dated — we’re guessing it was last renovated in the late 90s or early 2000s. 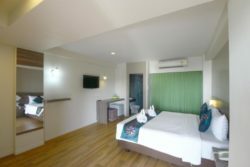 Rooms here are very spacious and have great views of Pattaya, with floor to ceiling windows and plenty of natural light. The beds are gigantic, furniture comfortable and Wi-Fi fast. As long as you aren’t expecting a brand new hotel, you’ll enjoy your stay here. It’s also a completely guest friendly hotel, with no joiner fees and kind reception staff who will happily let you bring a friend up to your room. Rated 7.8 out of 10 by Agoda. Located north of Pattaya City in Naklua, Bella Villa Cabana is a luxurious four star hotel with a variety of huge rooms. Seriously, the rooms here are gigantic. The smallest rooms offer 48 square meters of space, while the larger suites offer up to 170 square meters of living space, as well as ocean views. Since this hotel is a little outside Pattaya, the rates are very competitive compared to other luxury options. Many rooms are fitted with apartment-style features like stoves, ovens and other cooking equipment, as well as fast Wi-Fi. There’s also a great outdoor pool for relaxing during the day. From the hotel, it’s about 200 baht in a taxi to get into Pattaya. If you want a hotel that’s 100% guest friendly but far enough away from the hustle and bustle of Pattaya to let you have a relaxing time with your companion, Bella Villa Cabana is one of the best options in town. Rated 7.6 out of 10 by Agoda users. Until recently, Siam Bayshore was an aging four star hotel that offered good but not fantastic rooms. However, this hotel has recently been renovated (work was completed in 2016) and is now one of the best four star hotels in Pattaya thanks to its great area right across from Pattaya Beach. This is one of Pattaya’s older four star hotels, meaning it was built on a premium location that just isn’t available to hotel developers today. As such, it’s a two minute walk to Walking Street and about five minutes to the best part of Pattaya Beach from the hotel, plus a minute or two to the nightlife. From a location perspective, this hotel is very difficult to beat. From a quality perspective, the rooms here are everything you’d want, with modern furniture and nice decor that’s been recently updated. The Wi-Fi is fast, the on-site dining options are surprisingly good, and the facilities include a fantastic beachside swimming pool and one of the best gyms for a four star hotel in Pattaya. Very much recommended, especially after the recent renovation work. Rated 8.2 out of 10 by Agoda users. Pattaya has a great selection of five star hotels, most of which are fine with you bringing guests back to your room. 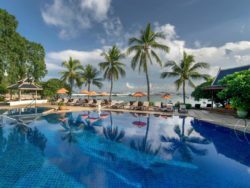 We’ve listed all of the guest friendly five star hotels in Pattaya below, along with user ratings and links to book via Agoda. Technically, Amari Ocean is a 4 1/2 star hotel, but its rooms and facilities are (in our opinion) deserving of the five star category. This large hotel is located just off Beach Road and has a great view of Pattaya Beach, as well as a good location that’s less than 10 minutes away from Soi 6, Walking Street, Central Festival Pattaya and other main areas by baht bus. It’s also a short walk to several local beer bars. Rooms at the Amari Ocean Hotel are spacious and luxurious, with sweeping views over Pattaya City and the beach, ultra-modern furniture and stylish decorating. The beds are gigantic (most rooms have king size beds) and the mattresses soft, supportive and comfortable. The rooms here are also on the large size, starting from 49 square meters and going up to 63 square meters for the suites. Facilities at the Amari Ocean Hotel include several outdoor pools, a garden setting, a well equipped fitness center and a good selection of bars and restaurants. You’ll also find some of Pattaya’s best fine dining here in Mantra, which is a great place to spend quality time with a date. The entire hotel is guest friendly, making it no problem to bring back a friend after a night out. Rated 8.2 out of 10 by Agoda users. Another 4 1/2 star hotel, the AVANI Pattaya is a great choice if you want five star quality without the full cost. Rooms here are modern, spacious and comfortable, with large beds and plenty of natural light. There’s also fast, free Wi-Fi throughout the hotel. The AVANI is located a short distance (about five minutes, assuming you walk) from Walking Street and about 10 minutes from Central Festival Pattaya, making it easy to enjoy the shopping and nightlife. There are several good beer bars within walking distance of the hotel, meaning you can walk straight out and enjoy a good night out. In terms of facilities, the AVANI has a large outdoor pool, very well equipped fitness center (seriously, it’s like a commercial gym in terms of quality) and large garden area for you to explore and enjoy. There’s also table tennis, several restaurants and an upmarket hotel bar. The AVANI is 100% guest friendly, with no hidden fees and polite staff that will respect your privacy during your stay. The Hilton is Pattaya’s most luxurious five star hotel, with an amazing location right on Beach Road (and on top of Central Festival Pattaya), the best beach views of anywhere in the city and several outstanding bars and restaurants. If you have the money and want an ultra-luxury guest friendly hotel to stay in, this is where you’ll want to be. Rooms at the Hilton Pattaya range from standard rooms to large suites, some of which have jacuzzis on the balcony. The entire hotel is extremely modern and has high quality beds, furniture and in-room accessories. Simply put, you will not find anywhere better than this in Pattaya. There’s also an amazing outdoor pool that overlooks Pattaya Beach, plus several great restaurants and cafes inside the hotel. Add a great location that’s minutes away from Pattaya’s best nightlife and the Hilton is easily the best hotel in the city. It’s also 100% guest friendly, with tolerant staff and no fees for bringing a guest back to your room. Rated 8.9 out of 10 by Agoda users. Although it’s not quite as luxurious as the Hilton, Baraquda Pattaya – MGallery by Sofitel is a great five star hotel that’s worth considering if you want to be a little further away from the action for a better night’s sleep. Baraquda is located on Pattaya 2nd Road, a short walk away from Beach Road (it takes less than five minutes to walk to the beach) and about 5-10 minutes from Walking Street and Central Festival Pattaya by baht bus. 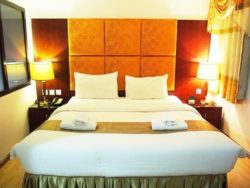 The hotel is highly luxurious, with ultra-modern rooms featuring high quality bedding and stylish furniture. All rooms have floor to ceiling windows, some with great views. In terms of facilities, Baraquda has a huge outdoor pool with plenty of chairs, recliners and tables for you to relax on. There’s a poolside bar, several restaurants and a great fitness center in the hotel. Like all of the hotels we’ve listed, it’s 100% guest friendly with no joiner fees for you to worry about. The InterContinental Pattaya is one of the best five star hotels in Pattaya, with a beachfront location (really, the hotel is right on the beach, which is very rare in Pattaya), luxurious rooms and some of the best facilities of any hotel in Pattaya. Before we get into the rooms, let’s cover the facilities. The InterContinental Pattaya has its own private beach area, a fitness center, huge outdoor swimming pool, spa, restaurants, bars and an executive lounge. The resort feels more like a remote estate than a hotel, with beautiful natural surroundings that make you feel like you’re miles away from civilization. As for the rooms, they’re comfortable and luxurious, with king size beds and large windows that offer great views of the hotel’s grounds or Pattaya Beach. There are even several gigantic villas that are available for rent. All rooms have free Wi-Fi and all of the luxuries you’d expect from the InterContinental brand. Despite its remote atmosphere, the InterContinental Pattaya is a short five minute drive from Walking Street and less than 10 minutes from Central Festival Pattaya by baht bus. The InterContinental Pattaya is a guest friendly hotel with no joiner fees, making it easy for you to bring friends back with you after a night out. 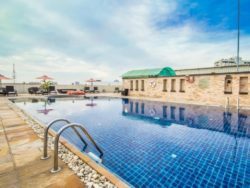 Less expensive than the Hilton or InterContinental, Royal Cliff Becah Hotel is an older five star hotel located on Pratumnak Hill. With views overlooking Pattaya City and Pattaya Beach, great facilities and one of the best swimming pools in the city, Royal Cliff Beach Hotel is a good option if you want a luxury guest friendly hotel with plenty of space and very little noise. Despite being located on the hill, the hotel is only a 10 minute baht bus ride away from most of the nightlife in Pattaya. 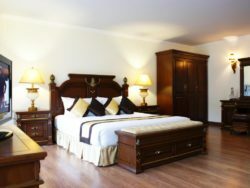 The rooms are extremely spacious and are well decorated with nice furniture, comfortable king size beds and free Wi-Fi. All rooms have balconies, some with mountain views and others with great views of the beach. Because this is an older hotel built before real estate values climbed in Pattaya, the grounds are massive and the facilities are excellent. There’s an amazing outdoor pool, a fitness center, tennis courts, squash courts, a spa, gaming room, pool hall and more. If you want a luxury hotel that really includes everything, this is it. Royal Cliff Beach Hotel is 100% guest friendly, with no joiner fees for additional guests. Rated 8.2 out of 10 by Agoda users. GuestFriendlyPattaya.com is a participant in the Agoda Partners program. We may receive a commission for purchases made through this website. © 2019 Copyright Guest Friendly Hotels in Pattaya. All Rights Reserved.